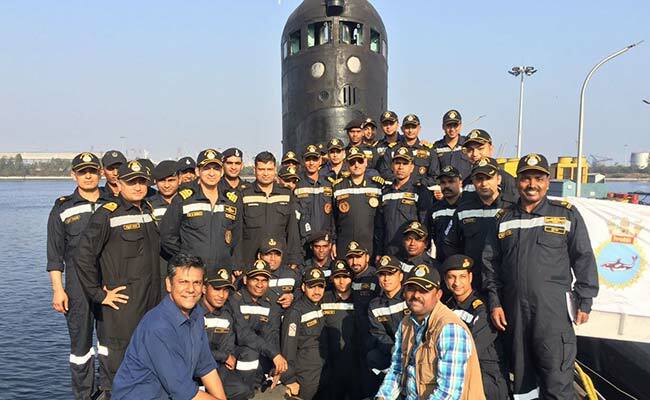 As I write this, the young crew of an Indian Kilo-class submarine, among the oldest operational submarines in the Navy, is preparing for their next mission. Massive batteries, each weighing 900 kilos, that power all the systems onboard are being installed, food and supplies are being stocked, mechanical repairs are being carried out. Within days, the INS Sindhukirti, based in Visakhapatnam will conduct its next sortie. No one, not even the Captain, knows where. Deployment orders are top secret. They come in an envelope which the Captain isn't allowed to open until he is already out at sea. All the crew can do is guess the duration of their next mission based on the quantity of food and supplies they are stocking in their submarine. For the next several weeks, perhaps even more than a month, the Sindhukirti will be prowling the depths of the Bay of Bengal, its crew entirely cut off from the outside world, other than listening to the occasional news report which the submarine is equipped to receive even while operating underwater. For more than a month, the 67 officers and sailors onboard will have no contact with their families. ''Once the last lines have been cast off from alongside, you are nowhere and no longer attached to your family. Whatever happens there, whatever happens to you, you are absolutely in two different worlds," said Captain GS Reedy, the 39-year-old Commanding Officer of the Sindhukirti.Elsewhere on the submarine, a crew of men head to the rest area. Their shift is over. It's time to hot-bunk: berths as beds are rotated. "At times, we even play around with the body clock of the men on board," said Captain Anurag Srivastava, the Director of Submarine Operations at the Eastern Naval Command in Visakhapatnam. "When we are out for extended deployments and we are close to the enemy course, we have to change the body clock so that we are more alert during the night time. All our activities take place during the night time like charging of the batteries and all." India has nine of these submarines, acquired from Russia in the 80s, in addition to four German designed Type-1500 submarines of nearly the same vintage. Powered by batteries which are charged by a set of diesel engine, they have limited endurance. Though missions can last up to 40 days, the submarine has to ascend once every 24 hours to what is known as snorkeling depth. As it hovers just short of the surface of the sea, fumes from its diesel engines are "snorted" out, and stale air onboard the submarine is replaced with fresh air from outside. It is during this period that a submarine like the Sindhukirti is most vulnerable: the loud "snorting" and the proximity to the surface means the submarine can potentially be detected by enemy aircraft, warships or other submarines. The kilo-class submarine is also slow and cannot sail at more than 31 kilometres per hour underwater. Nuclear-powered submarines, like the INS Chakra, which India has leased from Russia, and the INS Arihant, a home-grown nuclear ballistic missile submarine, are significantly faster and do not need to ascend close to the surface of the sea where they are vulnerable to detection. Neither do they need to refuel since their nuclear reactors are designed to run through the course of the life of the submarine. The Sindhukirti is not an easy work space. Every inch of space is occupied by an essential piece of machinery. Moving around the boat, its many ladders and water-tight hatches, is not comfortable. But this submarine doesn't aim for that. During the Soviet times when she was built, crew comfort was an afterthought. Newer submarines, like the French-designed Scorpene class submarines being assembled at Mazgaon Docks in Mumbai, are like a luxury-liner for sailors used to operating old submarines like this. On the Sindhukirti, there is one toilet for the nearly 70 people on board. There are no showers, and the crew of the submarine dispense with their starched uniforms for light-blue coloured disposable gowns not unlike the scrubs worn by doctors in operating theatres. Each set of clothes is worn for three days and then thrown away. 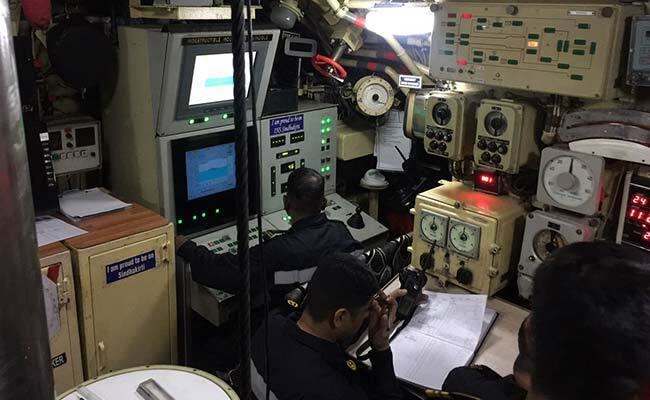 The Operations Room of INS Sindhukirti. It is one of the 13 diesel-electric submarines in Indian Navy. Within days, the INS Sindhukirti, based in Visakhapatnam will conduct its next sortie. No one, not even the Captain, knows where. Deployment orders are top secret. They come in an envelope which the Captain isn't allowed to open until he is already out at sea. All the crew can do is guess the duration of their next mission based on the quantity of food and supplies they are stocking in their submarine. 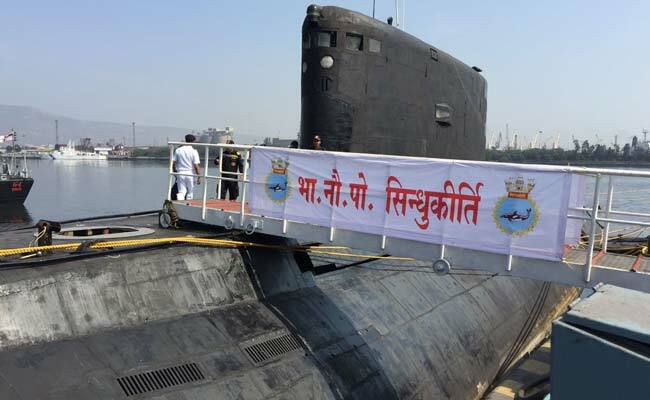 For the next several weeks, perhaps even more than a month, the Sindhukirti will be prowling the depths of the Bay of Bengal, its crew entirely cut off from the outside world, other than listening to the occasional news report which the submarine is equipped to receive even while operating underwater. For more than a month, the 67 officers and sailors onboard will have no contact with their families. ''Once the last lines have been cast off from alongside, you are nowhere and no longer attached to your family. Whatever happens there, whatever happens to you, you are absolutely in two different worlds," said Captain GS Reedy, the 39-year-old Commanding Officer of the Sindhukirti. INS Sindhukirti, Indian Kilo-class submarine, is among the oldest operational submarines in the Navy. On board the submarine, preparations are hectic. Constant drills to keep the men on their toes. Attack runs simulated in the Operations Room, the nerve-centre of the submarine, a small room flanked with electronic displays, old analogue systems and two periscopes. Instructions are shouted out by Captain Reedy, and officers and crew members respond, often simultaneously. It's controlled chaos but everyone knows what to do. The ultimate goal, had this been a real life situation, would have been to fire either a missile or a torpedo. "The process is special because first of all, when an enemy submarine is detected, we don't have anything to actually see. The only sense that we rely upon in acquiring the initial targeting information is a sonar," says Lt Commander Ankush Vyas, the Executive Officer of the Sindhukirti. "Sonar is totally passive. We work out the target motion parameters of the target, what direction he is heading to, what speed he is doing and what is the approximate range of the target. After doing that, we feed the solution to the fire control system. The fire control system not only generates its solution, but also prepares the torpedo tubes and feeds the targeting data to the torpedoes. When the order is received from the Captain, we fire the torpedo on the target." Elsewhere on the submarine, a crew of men head to the rest area. Their shift is over. It's time to hot-bunk: berths as beds are rotated. "At times, we even play around with the body clock of the men on board," said Captain Anurag Srivastava, the Director of Submarine Operations at the Eastern Naval Command in Visakhapatnam. "When we are out for extended deployments and we are close to the enemy course, we have to change the body clock so that we are more alert during the night time. All our activities take place during the night time like charging of the batteries and all." With the crew of INS Sindhukirti, based in Visakhapatnam, which will conduct its next sortie. 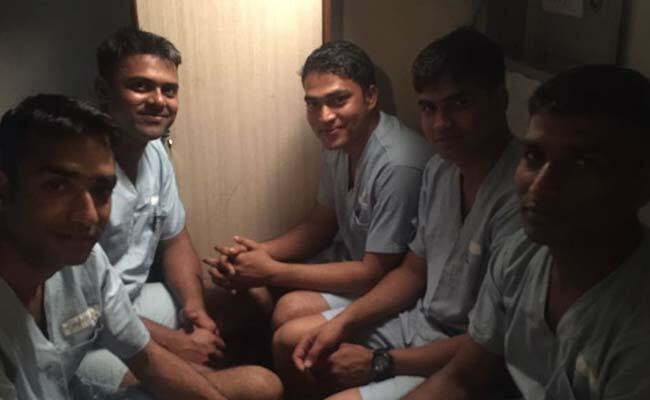 Sailors of INS Sindhukirti in the crew rest area. Six men sleep in this tiny space. Master Chief Petty Officer NP Mahto is the COXSWAIN or senior-most enlisted man onboard. A veteran submariner, he is the eyes and the ears of the Captain. When he isn't personally at the helm of the submarine controlling its movement, Mahto has to work to keep up the morale of the sailors onboard. "I tell them `See I'm an old man, but I'm running from fore to aft. So by listening to this, their courage comes up. And they do whatever we require," he said. Part of the process of keeping the men onboard motivated involves feeding them with fresh meals. Cooked in a tiny galley. The chefs onboard have a huge responsibility - the Navy takes its cuisine very seriously; the meals produced, vegetarian and non-vegetarian, are delicious by any measure. Everyone eats the same food - there is no preference or special meal for officers onboard. "We have a lot of activities planned for the sailors to bring them together. We try to occasionally break a part of our routine by having healthy competitions between them. Sailors come out with a number of humorous anecdotes while they are serving which we occasionally broadcast for everybody to enjoy," said the Captain.